Kenton's Infotainment Scan: TV IS SOOOO GOOOD!!! I LOVE IT!!! IT'S NEVER GOING TO DIE! Can we keep it? I actually don't watch much TV. Most of my shows have ended, so I only really have two shows that I watch religiously, and others that I catch on occasion. I get afraid of becoming invested in something amazing, only to have it cancelled on me (like Pushing Daisies). If I had more time, I'd watch established shows on DVD, and then get into the new season in September. That's another problem with all the choice we have nowadays: truly amazing shows are being canned prematurely because people have too many other things to watch. 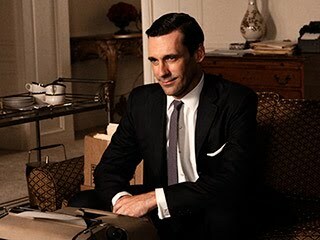 As it is, I may just have to start jumping into shows that have already aired a few seasons, like Mad Men. TV changed for the better in 1990 when some crazy individual commissioned Twin Peaks. It changed TV. Personally, I feel that it was not bettered until recently - Sopranos, Wire, Mad Men, Six Feet Under etc. I was having this conversation with someone recently. The advent of made-for-cable television has essentially availed something that was fairly rare before, which is quality story arcs. For me this came into clarity with the Sopranos, which for my money is superior to The Godfather. The reason being is that the Sopranos had the ability to really get into the minutia of the characters and add nice subtleties to the the storylines. This is accomplished with telling several stories in nice compact one hour packages over the course of several months instead of cramming a ton of info into one 2 and a half hour block. Also because people get so invested into the characters, they're more likely to buy the full season which they'll likely watch several times (at a higher price) instead of a movie they may watch just once. Yes, I think the Sopranos changed TV - and the Wire, Six Feet Under, and the rest that followed. Oh Major Sharpe, whyever did you become a recluse on bittorent sites. But on the topic of modern TV, I have little patience for TV shows or movies. I do not understand the hoopla over Mad Men, or anything else for that matter. About the only new show that I have grown to love, is Dexter.